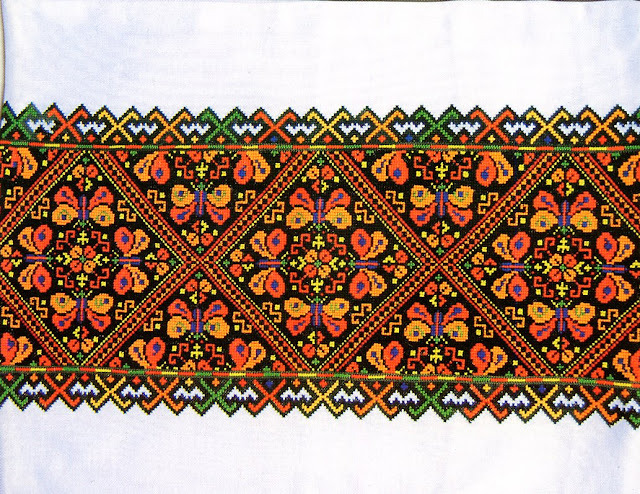 I have written about the Hutsul Nyzynka embroidery, which is considered to be the most typical. But Cross stitch embroidery has been made in the Hutsul lands for quite a long time now. 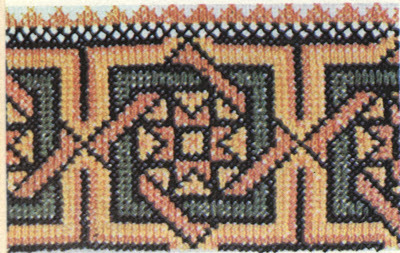 The color palette tends to be much the same, based on black, maroon, red, orange, yellow ochre, yellow and some admixture of green. This has become very popular in the foothills and lowlands north of the Hutsul lands proper. You find embroiderers doing this style of embroidery all over Halychyna and further. 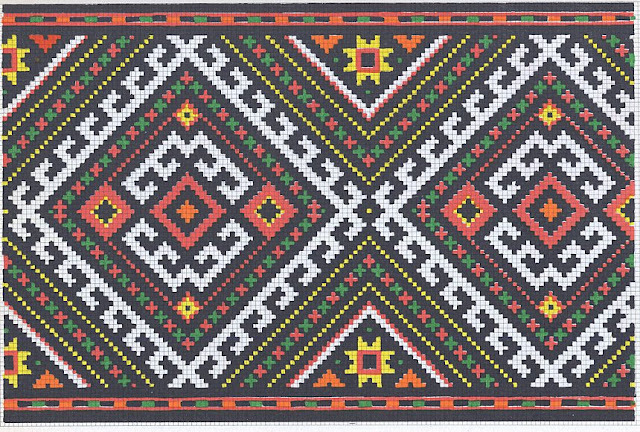 One version is doing a cross stitch imitation of Nyzynka designs, which tends not to be very effective, like this. 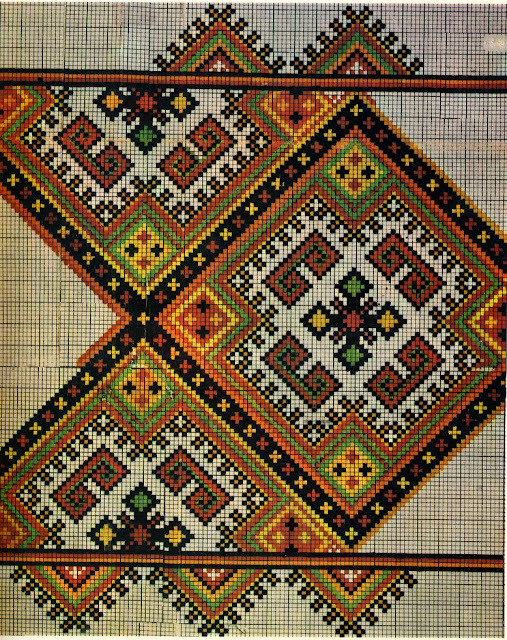 This results in a loss of the clean diagonal lines of the Nyzynka technique, obtaining instead a clumsy stairstep effect. 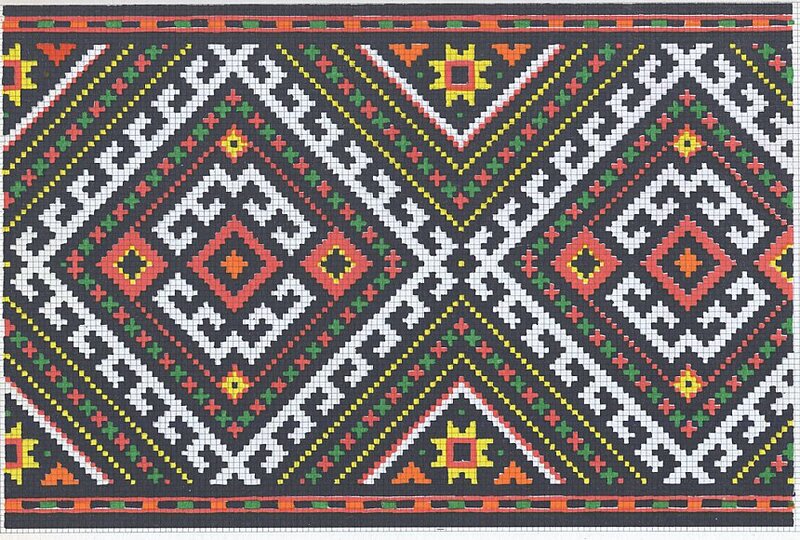 This particular design could easily be done in Nyzynka. 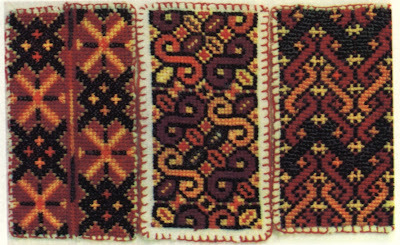 However, cross stitch enabled these designs to be elaborated in ways that Nyzynka was not capable of. 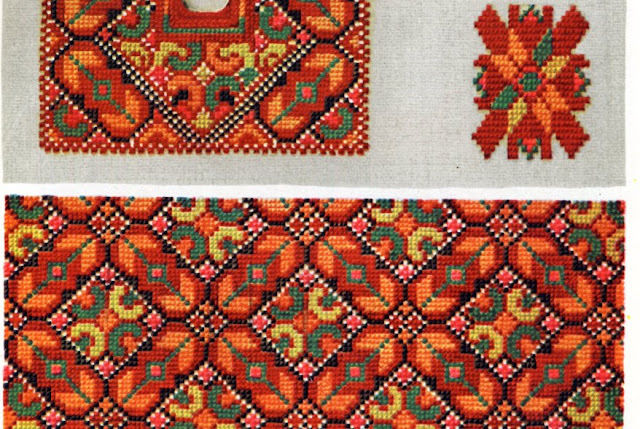 Here are a couple examples of Nyzynka inspired designs that take advantage of the versatilitly of cross stitch. 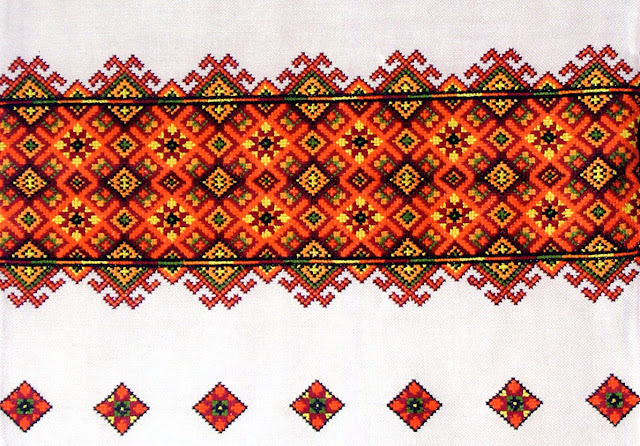 This first one is from a collection of graphed designs gathered and published by Ksenia Kolotylo. 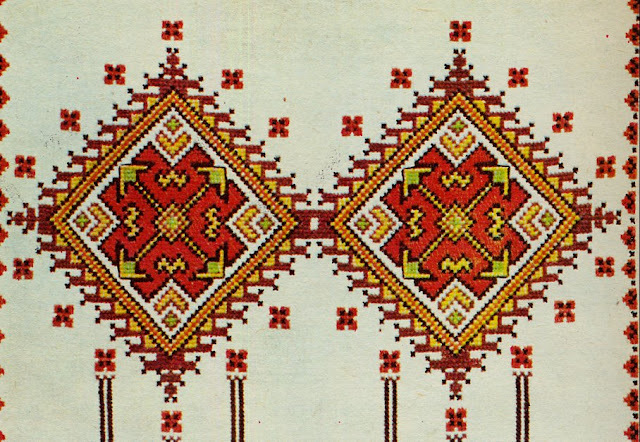 And this one was embroidered by Ol'ha Voznytsia. 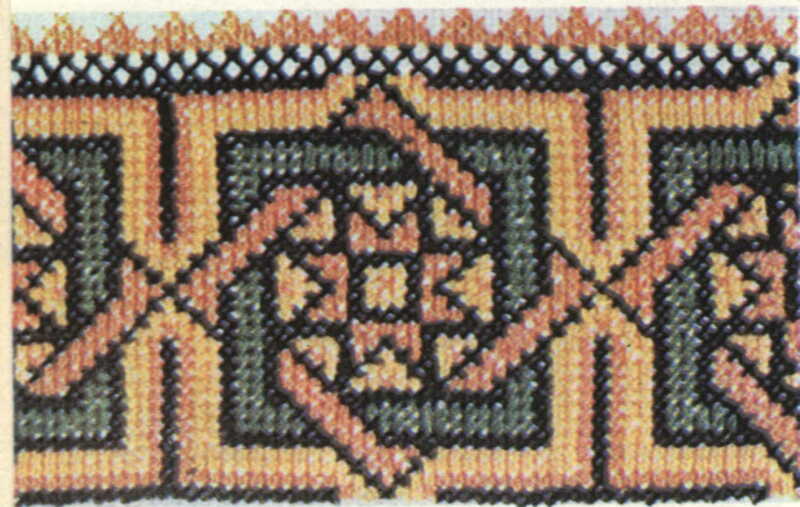 Cross Stitch is characterized by strong vertical and horizontal lines, and so lends itself to different sorts of designs. Here is a very old Hutsul design that has been copied and adapted over quite a wide area, even outside of Ukraine. Many people have copied and elaborated designs in this style, and there are literally hundreds of them out there. 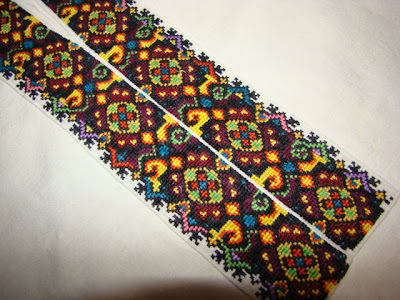 Here are a couple of pieces executed by Yevhenia Henyk. You will find these designs in many Ukrainian homes on various pieces of linen. 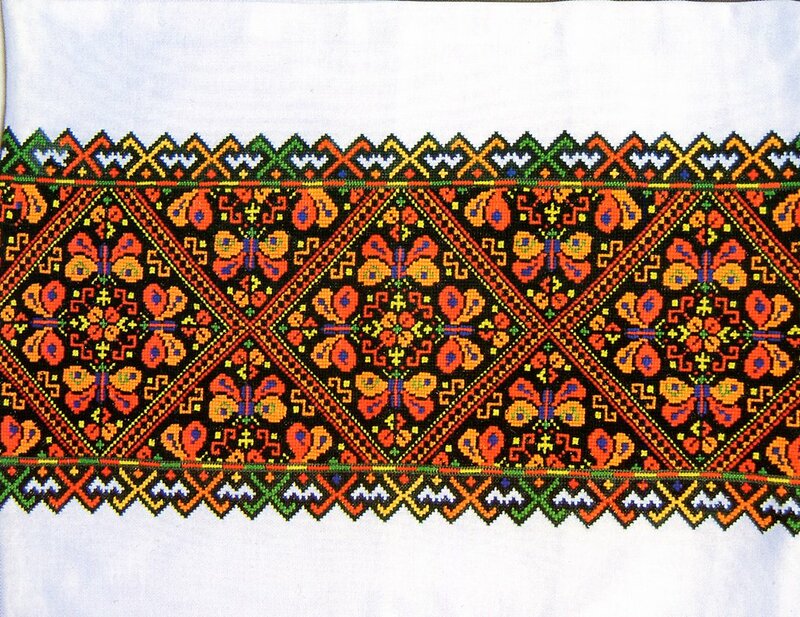 Pillowcases, table scarves, rushnyks, curtains, table cloths, clothing, etc, The art of embroidery is very much alive among the Ukrainian people, and these are some of the most popular designs. Just a few more examples. 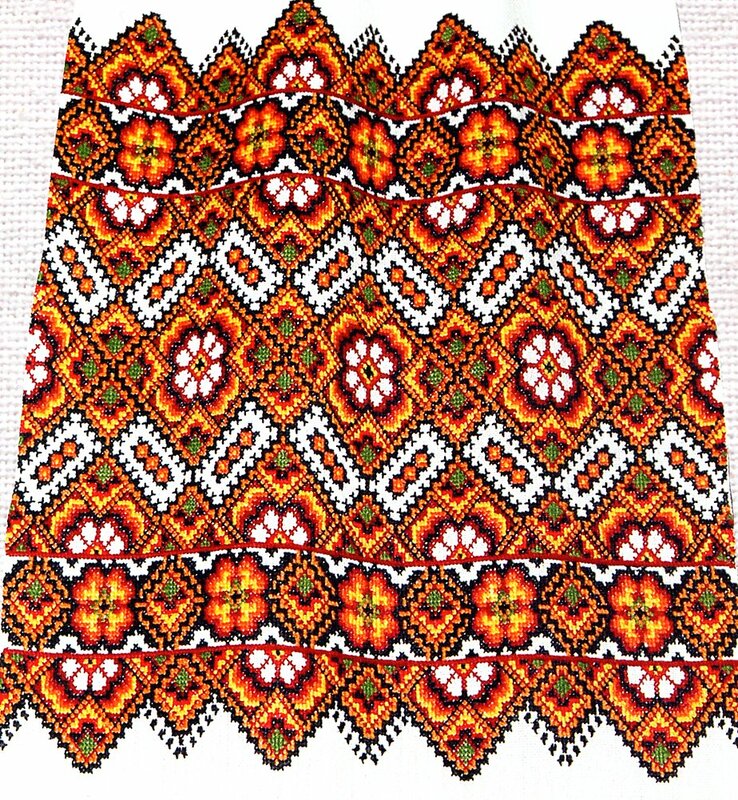 Yet another design from the collection of Ksenia Kolotylo, not derived from Nyzynka. And just a couple more examples. Maroon 777 or 815 or both, the darker could substitute for black, Red 666 or 321, Green 905, Ochre 741. Orange 947, and Yellow 444? [i think]. I hope you find this inspiring. I think Diane will find this useful. Please contact me with requests for research or commissions for something you may want designs, sewn or embroidered. 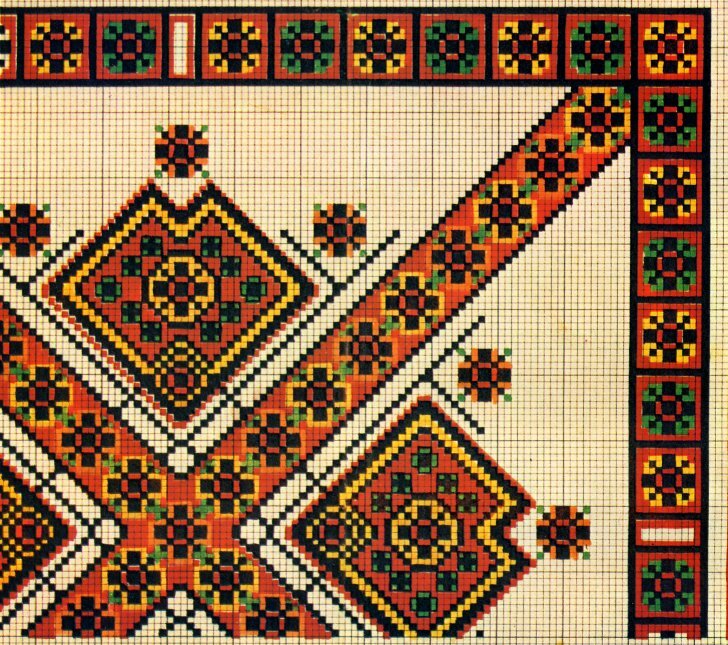 One positive thing that the Soviets did was to put the applied arts into the realm of art, and its practitioners on a level to be admired and respected. As they say, no-one can be wrong ALL the time. Go forth and be creative. Our ancestors made much of what they used day to day, and they felt it necessary for such items to be things of beauty. We should not settle for the ordinary or the ugly in utilitarian items.